What happens when enough people in the media continually laud over a single position? Then elevate this position far above every other position not only in their respective sport, but every sport known to man? What happens when owners of teams continually overpay for mediocre performance and fire coaches because this position isn’t catered to perfectly? When the easiest prognostication becomes well this team is going to win because of this teams player at this position is better? I’ll tell you. You create MONSTERS. The position I’m referring to is NFL Quarterback. And this off- season it has been a chief example and precautionary tale about people reading their own press clippings and becoming enamored with themselves with irrational illusions of grandeur, and over inflated egos. 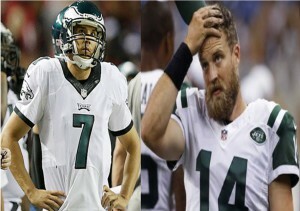 The main culprits are Sam Bradford of the Philadelphia Eagles, and Ryan Fitzpatrick of the New York Jets. Between these two they have demanded trades, expressed disdain for their franchises that gave them opportunity, and been insulted by multi-million dollar contract proposals. To add insult to injury they both have the same amount of playoff wins (0). And one has only endured an entire season twice in their career because of injury. As I alluded to in the beginning, it’s not all their fault. There are several contributing factors that have perpetuated this new phenomenon of over-inflated egos, and spoiled-brattiness. Owners and GMs have been listening to the so called “experts’ like Ron Jaworski (former QB) of ESPN, and Colin Cowherd of Fox Sports and the like saying constantly that if you don’t have a great quarterback like Tom Brady or Aaron Rodgers you’re going to fail in this league. The origin of these attitudes began with the overpaying of seemingly mediocre quarterback talents like Chicago Bears made Jay Cutler who became the highest paid QB in the game a few years ago, having minimum playoff success, and pedestrian completion percentages with a Pro-Bowl receiver (Brandon Marshall). We’ve become a society of over-valuing made by illusion and not substance. The apostle Paul said to the Romans 12:3 says “to every man that is among you, not to think of himself more highly than he ought to think; which indicates by no stretch of the imagination that you should not think high of yourself, but don’t over inflate your ego. The quarterback is important, and I often say if a football team was a car, the quarterback would be its onboard computer. However, there are other parts of a car that are extremely important as well. Just as the Bible says ‘all parts supplieth the whole” The engine of the team are the offensive a defensive lines. The wheels are the running game. The chasse, grill, are your inside and outside linebackers giving the car toughness and durability, while the frame are your cornerbacks because when it’s broken the car is totaled. The brakes are your safeties because they are a safety feature and you need them stop others. The accelerator and clutch are the receivers and tight end. They make a team shift gears and speed point totals. The season starts as a ¼ mile drag race, by thanksgiving it’s a cross country cannonball run, and in the winter months (playoff time) it’s a demolition derby. This reality check is further backed up by statistics and history. Defense wins championships. Most Super Bowl winners have had the better defense. They have had marquis pass rushers and shut down corners. They were defensive minded teams like the Steelers, Ravens, and Seahawks. Tom Brady’s first 3 wins with the Patriots were defensive lead. This past year was statistically Peyton Manning’s worst year, but it was Vonn Miller who got him the Lombardi Trophy. Posted in SPORTING NEWS Tags: Franken-QBs: They’re Alive!